126 Sherry Road, Harvard, Massachusetts 01451, U. S. A. Isolated ophiuroid ambulacrals have been discovered in washings from the so-called "white beds" of Lower Devonian limestones of the Barrandian area. They are unusual because they are sculptured and represent structural analogue of biserially arranged and alternating arm plates of many Devonian crinoids. We interpret these ambulacrals as belonging to a new species of the Family Cheiropterasteridae Spencer, 1934. This is the first from the forthcoming series of our articles concerning the ophiuroid fauna of the Barrandian Devonian (Czech Republic). The presence of isolated ophiuroid ossicles in washings from the so-called "white beds" (weathered portions of Lower Devonian limestone beds at Praha-Holyne, Praha-Klukovice and Praha-Podoli) was previously mentioned by Jirova & Nekvasilova (1959) but only very briefly (in a Czech-written preliminary report), without description or illustration. Hence, in Bohemia only the whole body fossils of Ordovician (and the rare, undescribed Silurian) ophiuroids attracted the attention of Lower Palaeozoic specialists but the Devonian ophiuroid ossicles of the Barrandian area remained practically unknown. A landmark study on Devonian ophiuroid ossicles was published by Becker & Weigelt (1975). It ought to be stressed that the second of the authors (RJP) has collected for years an abundant material of isolated skeletal ossicles of echinoderms (including ophiuroids) from all formations of the Barrandian Devonian. We have verified again by these washings that isolated ossicles should present a better fossil record of echinoderms than the relatively rare whole body fossils, which are sometimes extremely rare as in the Bohemian Devonian. In addition, the isolated ophiuroid ossicles show us details of the articulating facets and of the radial water vessel (RWV) that are practically not visible in the whole body fossils. Abundant ossicles, comprising a large portion of the whole ophiuroid material from the Bohemian Devonian decribed in this first article, have been collected especially from the quarries "Cerveny lom" near Praha-Klukovice and "Na Konvarce" at Praha-Smichov. Superficially, the ossicles resemble biserial arm plates of crinoids but have a distinct channel for RWV, a pore for the lateral branch from RWV to the tube foot, and a large podial basin. They are very unusual ophiuroid ambulacrals (halves of vertebrae) with proximal and distal articulatory surfaces without articulatory knobs or sockets, and without defined areas for the insertion of dorsal and ventral muscles. Also unusual is the distinct rugged ornament on the apical surface and the outer sides of the halves of vertebrae. These ossicles represent a previously unknown ophiuroid species. We interpret these ambulacrals (Ambb) as belonging to an undescribed species of the Family Cheiropterasteridae Spencer, 1934. The Bohemian ossicles probably represent the first Cheiropterasteridae from a typical limestone lithofacies. The so far reported members come from slates (Germany), shales (England), carbonate bank with bioherms and intervening silt substrate (U.S.A.), and from mudrock-siltstone-sandstone sediments (Ceres Subgroup, South Africa, see Theron & Johnson 1991). The characteristics of this ophiuroid family are alternating hemicylindrical Ambb, wide adambulacrals (Adambb) lacking vertical spines, and extremely swollen disk that is unplated at its dorsal side and extends to (or very close to) the tips of the arms (Jell 1997). The included genera are Cheiropteraster, Loriolaster, Vandelooaster, and Hexura (P. A. Jell will propose a substitute name as Hexura was used previously for a spider). Isolated ossicles have not been described previously for these genera. Cheiropteraster giganteus, Loriolaster mirabilis and L. gracilis occur in the Lower Devonian Hunsruck Slate (Lehmann 1957, Bartels, Briggs & Brassel 1998); an ophiuroid cf. L. gracilis occurs also in the Silurian (Lower Ludlow Shales) of Leintwardine, Herefordshire (Hotchkiss 1978); Vandelooaster plicatilis occurs in the Mississippian of Crawfordsville, Indiana (Jell 1997), and Hexura weitzi occurs in the Lower Devonian Bokkeveld Series of South Africa (Spencer 1950). Comparison of the discussed Bohemian ossicles with the structure of Loriolaster mirabilis is informative. L. mirabilis has Ambb that are very thick and that is seen not just from the apical side but also from the oral one. We show this in a very schematic diagram (Text-fig. 1a) of L. mirabilis which depicts the Ambb as alternating half-cylinders; the double row of Ambb forms an cylindrical ambulacral axial skeleton. Study of the axial skeleton of L. mirabilis helps to explain two unusual features of the ossicles. The ossicles from the Bohemian Lower Devonian do not have clear places for the insertion of dorsal and ventral longitudinal muscles. Likewise, in L. mirabilis there are no clear places for attachment of these muscles. The Bohemian ossicles do not have prominent articulatory knobs and sockets. In L. mirabilis the successive Ambb seem to be firmly pressed together, forming a solid and stiff structure that nevertheless can bend somewhat (analogous to the way that a biserial crinoid arm or a crinoid stem are formed and can bend somewhat). It seems to us quite likely that such a solid and stiff axial skeleton may not possess well-developed articulatory knobs and sockets. The Bohemian Ambb were distinctly keeled at their median part (see esp. Text-fig. 1b and Text-fig. 2; direct view on the keel is on the Photo 2), and this shape probably helped keep the structure relatively firmly locked. The keeled shape of the Ambb is proof that the Ambb were alternating. The zigzag median suture produced by the keeled (convex angular) shape of the Ambb is an unusual feature and, to the best of our knowledge, is not found elsewhere among ophiuroids except in Vandelooaster. In Vandelooaster Jell (1997, p.306-307) describes a zigzag of the ventral radial line of junction between the two columns of Ambb as a result of each Amb having a slightly projecting adradial margin (the tip of this projection, in the midlength of the plate, points directly at the suture between successive Ambb in the opposing column). To the species description of V. plicatilis it is said: "Ambb alternating in two columns; median line zigzag in ventral view but straight or slightly zigzag in dorsal view", (Jell 1997, p. 307). A similar keeled convex angular shape and zigzag median line of junction between the two columns of Ambb occurs in the asteroid Urasterella medusa (Hudson 1916, p. 127, and Pl. 3). First of the authors (FHCH) has seen large Urasterella (in a private collection, species not identified) that have this feature of alternating Ambb, with projecting adradial margin, making a zigzag median suture. But as an asteroid the Ambb should be opposite. 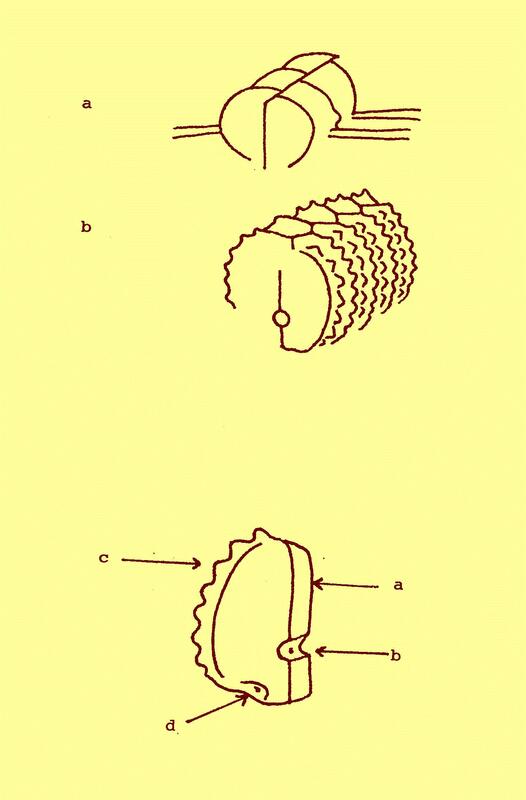 Our interpretation is that the Ambb of this Urasterella are so solid, block-like sutured that the placement of the Ambb as either opposite or alternate is no longer an important constraint (perhaps the shapes of the sutures become determined in response to mechanical forces; plates in regular echinoids have convex outlines and zigzag sutures between columns of plates). A zigzag suture of a different type occurs in certain ophiuroids of the family Protasteridae. Where this radial line is zigzag it is often the result of the adradial margin of Ambb being concave, with the adradial proximal and distal corners projecting into successive concavities on Ambb of the opposing column (the suture between successive Ambb thus points directly at the concavity in the opposing Amb). It is easy to see in e.g. Protasterina fimbriata (Schuchert, Pl. 35, fig. 4). We can interprete this type of zigzag structure as a good design in a flexible arm. It is interesting to note that Sumrall & Sprinkle (1998) wrote that it is a synapomorphy of the Asterozoa that the perradial suture of flooring plates (Ambb) is straight (not zigzag). The two types of zigzag sutures, convex angular in Cheiropterasteridae and U. medusa, and concave angular in Protasteridae, appear to be secondarily evolved and to be useful taxonomic characters. In L. mirabilis and other Cheiropterasteridae up to now we do not see any ornament on the Ambb, whereas the Bohemian Ambb have a conspicuous and rugged sculpture (generally a double row of prominent knobs) on their lateral sides. This is also a reason to suppose the Ambb from Bohemia as representing a new, undescribed species. It is really highly unusual for ophiuroid Ambb to possess an ornament. Nevertheless, there are some reports of such phenomenon: Petr (1988 - possible ornament on Ambb of Bohemura jahni), Rasmussen (1950: 121, Pl. 18, fig. 11 - sculpture on isolated Ambb of Asteronyx? ornatus), and Mortensen (1913: 12, Pl. I, fig. 8; Pl. II, fig. 4 - glassy knobs on the vertebrae of "Ophioteresis elegans" and other species of Ophiothela). As noted by the latter author, the knobs are beneath thick skin, which must be removed to make them distinct. There is ornament also on the Ambb of the Devonian Hunsruckaster peregrinus (Lehmann 1957: 142, figs 27, 28 - Asteroidea incertae sedis). A feature not present in the Bohemian Ambb is the groove on the outer side of the halves of vertebrae seen in V. plicatilis (Jell 1997: Fig. 1.7 "dorsal abradial groove"). 1) "Cerveny lom" quarry near Praha-Klukovice (Lower Devonian, Pragian, Lodenice Limestone) - very abundant, occurring together with other rich echinoderm fauna: crinoids (the most abundant inadunates, partly flexible crinoids and camerates), rhombiferans and diploporits, blastoids, asteroids, other ophiuroids, echinoids, cyclocystoids and holothuroids (for the information on the lithology see also Prokop 1986). 2) "Na Konvarce" quarry at Praha-Smichov (Lower Devonian, Pragian, Lodenice Limestone) - similarly abundant, accompanied with the same type of echinoderm fauna. 3) "Divci hrady" quarry (today back filled) at Praha-Smichov (Lower Devonian, Pragian, Lodenice Limestone). 4) Srbsko near Beroun, in an unnamed quarry near the Kacak Creek mouth to the Berounka River (Lower Devonian, Pragian, Slivenec Limestone). 5) "U jezirka" quarry, Praha-Hlubocepy (Lower Devonian, Dalejan, upper part of the Trebotov Limestone) - one unique isolated ambulacral plate. 1) Field Museum of Natural History, Chicago, with thanks to Dr. Greg Buckley, Invertebrate Paleontology Collections Manager. Loriolaster mirabilis, Gurley Collection, with labels by Stuertz, dated April 1889, specimens UC 18889, PE 56533 (well-prepared from both sides), and PE 56534. 2) Royal Ontario Museum, Toronto (ROM), with thanks to J. Waddington, P. Fenton, D. Rudkin, and P. von Bitter. L. mirabilis ROM No. 1422D (labeled Aspidosoma tischbeinianum), aboral view, well-prepared specimen. 3) University of Cincinnati Geological Museum, Geology Department (UCGM), with thanks to D. L. Meyer. Latex cast of Hexura weitzi, UCGM No. 34733 (Hansman, Shaw & Pettibone 1962: 46; original, No. 11055 is deposited in the South African Museum, Capetown). 4) Museum of Natural History, London, with thanks to D. Lewis. Latex casts of cf. L. gracilis, BMNH 47949, BMNH 47953, BMNH 38527 (all labeled Furcaster leptosoma). Izolovane ambulakralni desticky (Ambb) hadic byly nalezeny ve vyplavech tzv. "bilych vrstev" vapencu ceskeho spodniho devonu (oblast Barrandienu). Jsou neobvykle, protoze jsou skulpturovane a protoze predstavuji kuriozni strukturni ekvivalent biserialnich ramen cetnych devonskych krinoidu. Tyto Ambb zde prirazujeme k zatim nespecifikovanemu novemu druhu celedi Cheiropterasteridae Spencer, 1934.
a) Loriolaster mirabilis, a schematic sketch of a specimen from Hunsruck Slate (Lower Devonian of Germany, Emsian) according to PE 56533, deposited at the Field Museum of Natural History, Chicago, showing alternating ambulacrals (Ambb) from oblique apical view. The double row of Ambb form a cylinder-shaped ambulacral axis to the arm; the diameter of this cylinder is large enough to cause it to stand out as a topographic high whether seen from the oral side or from the aboral side of the animal; the laterals (or adambulacrals, Adambb) are drawn out laterally and located approximately at the mid-plane of the Ambb; the Adambb are not as thick dorso-ventrally as are the Ambb and so the ambulacral 'groove' is not really a groove in the fossil, although it is very wide. b) Cheiropterasteridae gen. et sp. indet., a schematic reconstruction of part of an arm from Lodenice Limestone (Lower Devonian of Bohemia, Pragian) according to isolated Ambb deposited in the National Museum, Museum of Natural History, Praha (NM, MNH) showing an interesting structural analogue with biserially arranged arm plates of some crinoids, from oblique apical view, radial water vessel (RWV) is pictured as a small circle accommodated within the opposing Ambb. d) distinct podial basin with a small pore for the tube foot. Cheiropterasteridae gen et sp. indet., "Cerveny lom" quarry near Praha-Klukovice, Lodenice Limestone (Lower Devonian of Bohemia, Pragian), SEM photographs of isolated ambulacral ossicles (Ambb) by J. Kulich, all specimens deposited in collections of the Palaeontological Department, National Museum, Museum of Natural History, Praha, all specimens x47. Text-fig. 1: isolated ambulacral ossicle (Amb), inv. n. L 33080, in the same position as the idealized specimen in the drawing Fig. 2. Text-fig. 2: slightly oblique view of the same specimen showing the distinct sharp median keel crossed in the lower portion by deep furrow for the radial water vessel (RWV) and pierced by a pore of the lateral branch of RWV. Text-fig. 3: isolated Amb, inv. n. 33081, showing double row of knobs on the lateral margin and, in the lower portion, a large podial basin with a pore for the tube foot. Text-fig. 4: isolated Amb, inv. n. 33082, showing median keel on the right side with conspicuous channel for RWV and pore for the lateral branch of RWV, distinct podial basin at lower left and ornament of sharp knobs in upper left. Text-fig. 5: similar isolated Amb, inv. n. 33083, direct view of a large podial basin (lower left portion of the picture) with a pore for the tube foot and rich sculpture of sharp knobs (left and upper portion of the photo). Text-fig. 6: isolated Amb, inv. n. 33084, showing a typical ornament on the lateral margin of the ossicle consisting of a double row of knobs (left portion of the picture). Bartels, C. - Briggs, D. E. G. - Brassel, G. (1998): The Fossils of the Hunsruck Slate: Marine Life in the Devonian. Cambridge Palaeobiology Series, 3. Cambridge University Press. Becker, G. - Weigelt, H. (1975): Neue Nachweise von Ophiuroidea in Rheinischen Schiefergebirge. - Notizbl. hess. L.-Amt Bodenforsch., 103: 5-36. Wiesbaden. Hansman, R. H. - Shaw, F. C. - Pettibone, W. A. (1962): Supplement to the catalog of the type specimens of fossils in the University of Cincinnati Museum. 131 pp., University of Cincinnati, Ohio. Hotchkiss, F. H. C. (1978): Studies on echinoderm ray homologies: Loven's law applies to Paleozoic ophiuroids. - J. Paleont., 52, 3, 537-544. Lawrence. Hudson, G. H. (1916): On the genus Urasterella with description of a new species. - New York State Mus. Bull., 187, 12th report of the Director (for 1915), 117-163. Albany. Jell, P. A. (1997): Early Carboniferous ophiuroids from Crawfordsville, Indiana. - J. Paleont., 71, 2, 306-316. Lawrence. Jirova, D. - Nekvasilova, O. (1959): Vyskyt hadic (Ophiuroidea) v ceskem devonu (Barrandien). (In Czech) - Cas. Miner. Geol., 4, 95. Praha. Lehmann, W. M. (1957): Die Asterozoen in den Dachschiefern des rheinischen Unterdevons - Abh. Hess. Landesamt. Bodenforsch., 21, 1-160. Wiesbaden. Mortensen, Th. (1913): On the alleged primitive ophiuroid Ophioteresis elegans Bell, with description of a new species of Ophiothela, p. 1-18, pl. I-II. In: Mindescrift for Japetus Steenstrup, X, Bianco Lunos Bogtrykkeri. Kobenhavn. Petr, V. (1988): A notice on the occurrence of Bohemura jahni (Echinodermata, Ophiuroidea) in the Bohemian Middle Ordovician. - Vest. Ustr. Ust. geol., 63, 1, 35-38. Praha. Prokop, R. (1986): Contribution to crinoid stratigraphy. In: I. Chlupac: Cerveny lom quarry near Praha-Klukovice (Pragian-Zlichovian boundary), p. 18-20. In: Field Conference of the International Subcommission on Devonian Stratigraphy "Barrandian-Moravian Karst 1986": A field trip guidebook. - Ustr. Ust. geol., Praha. Rasmussen, H. W. (1950): Cretaceous Asteroidea and Ophiuroidea with Special Reference to the Species Found in Denmark. - Danmarks Geologiske Undersogelse, II. Raekke, 77, 1-133. Kobenhavn. Schuchert, Ch. (1915): Revision of Paleozoic Stelleroidea with special reference to North American Asteroidea. - U. S. Nat. Mus. Bull., 88, 1-311. Washington, D.C.
Spencer, W. K. (1950): A new brittle-star and an eurypterid from the Bokkeveld strata. - South African J. Sc., 46, 300-301. Johannesburg. Sumrall, C. D. - Sprinkle, J. (1998): Phylogenetic analysis of living Echinodermata based on primitive fossil taxa, p. 81-87. In: R. Mooi & M. Telford (Eds): Echinoderms: San Francisco. A. A. Balkema, Rotterdam. Theron, J. N. - Johnson, M. R. (1991): Bokkeveld Group (including the Ceres, Bidouw & Traka Subgroups). p. 3-3 through 3-5, In: M. R. Johnson (Ed. ): Catalog of South African lithostratigraphic units. S. A. Committee for Stratigraphy.